The Dodgers aren’t going to win every game. Nor is everything going to come up roses for them every night. The bounces won’t go our way every single game. That’s baseball. Sometimes you just have to shake your head in amazement at the sport of baseball. It leaves you breathless, agitated, shocked, and gassy all at once. The Dodgers lost game 2 of the World Series to the Astros on Wednesday evening 7-6 in 11 innings in one of the most incredible World Series games ever played. It didn’t work out for the Dodgers but we saw some incredible sequences and several Dodger comebacks. The series it tied as it shifts to Houston for games 3-5. This game will forever be second guessed as manager Dave Roberts made a multitude of questionable pitching changes. Look Roberts has done a wonderful job in his second year as Dodger’s manager. He’s pushed all the right buttons and been a leader in the clubhouse. However he’s not perfect and there will be games like this every now and then where you look at the moves and scratch your head. The first move that everyone has been questioning was the removing of starter Rich Hill in the top of the fifth inning. Hill wasn’t exactly dominant, but he was pitching well. Hill had only allowed one earned run through 4.1 innings and struck out 7. He walked three (one intentionally) and made just 60 pitches. It seemed as if he should have been at least allowed to work through the fifth inning. I don’t have any doubts in my mind he could have pitched another inning or more. Roberts gave him a quick hook, and replaced him with Kenta Maeda. I understand the reasoning. The Dodgers don’t like to let the starters face the lineup a third time through the order. The numbers say that the pitchers are the least successful when facing a lineup for the third time. Mix that with a dominating Dodger bullpen that hadn’t allowed a run in 28 consecutive innings in the postseason and that could be understood. However the bullpen has been so good and pitched so many innings it’s unrealistic to expect these guys to be perfect throughout the playoffs let alone the rest of the World Series. Eventually one or two of them are going to allow something which should have been expected. That’s why Roberts should have lengthened the game by letting Hill pitch a little longer. The Dodgers rallied in the fifth and sixth innings on a Joc Pederson solo home run and a Corey Seager two-run shot in the sixth to put the boys in blue up 3-1. A two-run lead is never insurmountable especially against the most dangerous offensive club in the American League. The strange pitching decisions continued. Maeda was hooked early after giving up a single in the top of the sixth inning. With one out Tony Cingrani was called in and he got a huge double play to end the inning. He threw just one pitch and I wonder why he wasn’t allowed to go back out for the next inning. Instead Cingrani was wasted and Ross Stripling started the seventh inning by walking the lead-off hitter and then he was taken out for Brandon Morrow. To Robert’s credit Morrow did get through the seventh and into the eighth. Morrow unfortunately gave up a double to start the eighth frame and the short leashes continued again as Kenley Jansen was called in for a six-out save. Roberts seemed spooked. Here’s the thing, Kenley has pitched in every postseason game this year for the Dodgers. Normally he’s an automatic game closer and save clincher. However he’s not a machine and can’t be expected to pitch every game without ever allowing a run. So he allowed a run in the eighth on a grounder up the middle from Carlos Correa and the lead was cut to 3-2. In the ninth Kenley gave up a one-out game-tying homer to Marwin Gonzalez and we were headed to extra innings. It was a strange sight seeing Kenley in the dugout of a tie game. Usually the game is over once he enters. The problem there was that there were only two pitchers left in the bullpen, Josh Fields and Brandon McCarthy. Fields has a problem with home runs and he was terrible giving up two jacks to Jose Altuve and Correa to put the Astros up by two. Thankfully the Dodgers did tie it up in dramatic fashion in the bottom half of the tenth. Unfortunately they couldn’t walk-off and McCarthy was looming in the bullpen. As predicted McCarthy gave up a two-run home run to George Springer in the top of the eleventh. The Dodgers once again tried to rally in the bottom of the eleventh but fell just short, losing the game by a run. At least the bullpen divers were in full force. Roberts has been terrific all season long, but it’s fair to look at these moves in a vacuum while using a magnifying glass through a telescope. If the Dodgers don’t win the series we’ll look back at these moves and wonder while playing armchair manager all winter. There’s no reason to bag on Roberts, but there is every reason to analyze the odd moves. It should have been 4-2! But sadly it wasn’t. Still what a game! What an epic thriller we witnessed! One thing Scott. It was Watson who got the DP on a single pitch. Cingrani came in after Fields gave up the back to backs and finished the 10th. I would have left him out there for the 11th. Hell, I would have warmed up Wood. Anybody but McBrittle. I put him back on the DL and activate Baez. What was surprising was that Jansen had Gonzalez in a 0-2 hole when he homered. Kenley gets the guy 99 percent of the time, but not last night. Breaking news……….Yankees fire Joe Girardi. WTF? You have got to be kidding me. Also, Garvey blamed the Dodgers loss on Millenial’s. Says they are ruining the game…. Okay Steve, whatever floats your boat. “Felony stupid is a good term for many of the “opinions” here today. Like everyone else, I don’t think Roberts should have taken out Hill that early, especially with a bunch of right hand hitters, coming up next, because he actually has better numbers against righties, then lefties! It was good to see Joc hit that ball out, but with Joc you have a double edged sword, because he might hit one out, but he has trouble just putting the ball, into play, and that hurt us, later in that game! But Joc is not the only one on this team, that can’t put the ball in play, when it is needed, and I think any major leaguer, should be able to put the ball in play, when it is needed! I don’t know about anyone else, but when I saw McCarthy was on this roster, I was sickened, because I don’t believe he deserved to be on this roster, and I don’t think he would be good, coming out of the bullpen! McCarthy is no grinder, and I don’t think he has the same competitive spirit, that most major leaguers have, and because of all of this, he is not good in tough situations. He was out for two months, for a so called blister, but some might call this blister, the Yips! He has not earned a penny of that multi year contract he was given, because he has spent more time, sitting on the bench, making witty remarks, on Twitter! Here ya go MJ and others that weren’t too thrilled with the managing job done last night, enjoy some very good info listed for both last night’s game and the upcoming Game 3 (Dufus you can skip it, it won’t make any sense to you and you are trying too hard to be disagreeable). –Let’s talk about Rich Hill for a moment. Dave Roberts pulled him after he pitched four strong innings Wednesday, because he was about to go through the Astros’ lineup for the third time. The Dodgers gave him a three-year, $48-million contract in the off-season. I thought it was a good deal at the time, but here’s what I don’t understand: If you don’t think a pitcher can successfully pitch through a lineup for a third time, why are you giving him $16 million? The thought process this season is that a starting pitcher, particularly Hill, turns into a pumpkin when he faces a lineup for the third time. Is that correct in Hill’s case? Let’s look like at the numbers this season. First time through a lineup the opponent hits: .192/.286/.318. That’s really good. Second time through a lineup: .236/.324/.450. Uh oh, numbers are going up. Third time through the lineup: .158/.208/.200. Wait, what? His numbers are actually better the third time through the lineup than any other time? Gee, I’m not seeing a big difference. Which makes the decision to remove Hill after four innings a bad decision. He went four innings, giving up one run on three hits while striking out seven and walking three. He had only thrown 60 pitches. So, try to squeeze a couple of more innings out of him. Then you can use Kenta Maeda/Tony Watson in the sixth/seventh, Brandon Morrow in the eighth and Kenley Jansen in the ninth. Because again, why are you paying a guy $16 million if you don’t trust him to go six innings? I don’t blame Hill for being irate. He had every right to be. –Even though the Dodgers lost, that was a really great game. –Nice of Josh Fields to fill the Pedro Baez role in Game 2. He retired no one, giving up two homers and a double. I could have done that. –If you blinked, you may have missed Ross Stripling. Four pitches, one walk and he’s out of the game. 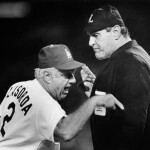 –We can moan and groan about things the Dodgers did wrong, but sometimes you have to tip your cap to the opponent. The Astros are a great team. They didn’t win 101 games by accident. –It’s hard to win a game when you only get five hits and the other team gets 14. –That being said, when you are up 3-1 on Justin Verlander, you need to win. –I had one person email me a few seconds after Jansen gave up the tying homer. He was irate and said the Dodgers would lose the series, 4-1. If that’s how you feel, just stop watching and give any Dodgers gear you own to a real fan. –Even Mariano Rivera lost a game in the World Series. –Chris Taylor, Corey Seager, Justin Turner and Cody Bellinger combined to go one for 17. Hard to win when that happens. –How nice was it to see Joc Pederson hit a home run? And how sad was it to see him strike out with a runner on third and one out? That’s Pederson’s career in a nut shell. –Hill had seven strikeouts in four innings. Over the next seven innings, the bullpen struck out only one. –The Astros can’t feel too comfortable, because the Dodgers were hitting rockets off of their bullpen. They just kept hitting them right at people. –The Dodgers acquired Yu Darvish for situations like Game 3. Let’s see what happens. 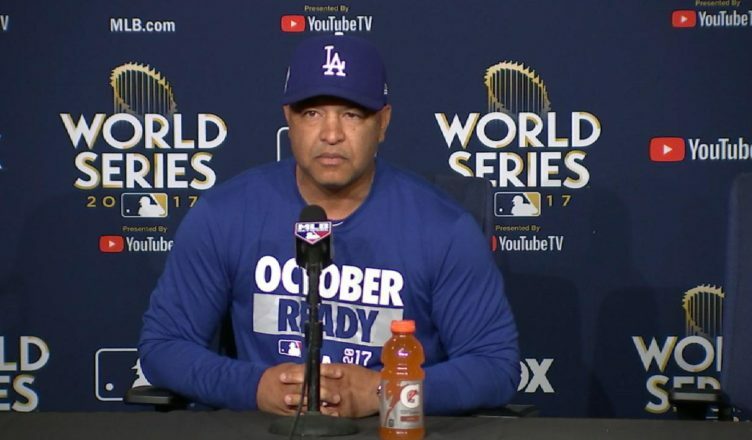 –Now the Dodgers need to shake it off and come back strong in Game 3. That’s what championship teams do. Dodgers vs. Lance McCullers Jr. Thanks for bringing that article on this site! I read this earlier today, and I thought it was a well written article. And I felt better about the Dodgers, after I read this article, today. This writer that wrote this article, always gets to the point, and he writes in a very simple way, and he can be pretty witty at times. I thought when he said that Fields took Baez place in the post season, that was funny! And those stats don’t support Roberts choice, of taking Hill out of this game either! The difference in the strike outs, between Hill and the relievers, is a very big difference, and that just makes Roberts decision, seem like a pretty bad decision! And I am a Roberts supporter, but I do think he made a mistake. I also couldn’t believe that Joc hasn’t learned a thing, after he was sent down. Because Joc never tried to just hit a fly ball into the outfield, he instead, swung hard at every pitch, he swung at! And the last two pitches he did swing at, were out of the strike zone! Gold glove finalists announced. Only 2 Dodgers on the list, Puig and Seager..ludicrous…Cody played gold glove caliber 1st base and Turner not nominated again??? By the way FAZ lovers…….your boy Grandal not on there either…..guess passed balls keep you out of the running especially when you lead the league in that stat. Gold Glove awarded by loser idiots who don’t understand the beauty of Sabre Uber Alles. Grandal got an MVP vote from guy over on Fangraphs. Actually Turner was one of the candidates, that was up for a gold glove last year at third. That’s last year. He is not on the list this year. Sounded in the post game interviews like ole Dave was talking out of the side of his mouth. He avoided the controversy pretty deftly. What I heard Dave say on the post game show last night, was that he would take Kenley every time, with a one run lead.